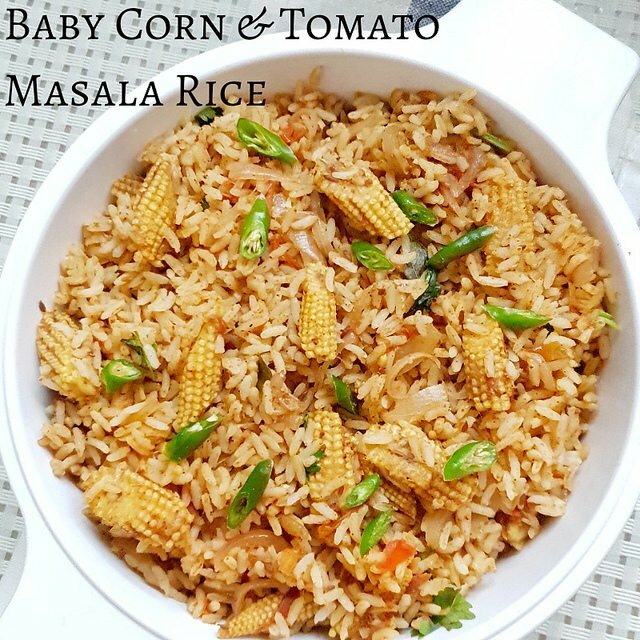 Baby corn and tomato Masala rice with easy step-by-step instructions and video for your easy understanding. 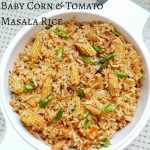 This Baby corn and tomato Masala rice is a spicy and tasty one pot rice recipe which you can prepare and give as a lunch box recipe for your kids and husband. 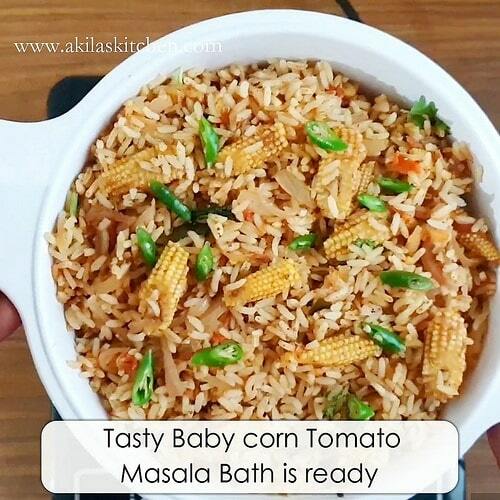 In this baby corn and tomato Masala bath, the baby corn is cooked in the spice masala like pav bhaji Masala and garam Masala and the tanginess of the tomatoes gives a nice flavour to this rice. 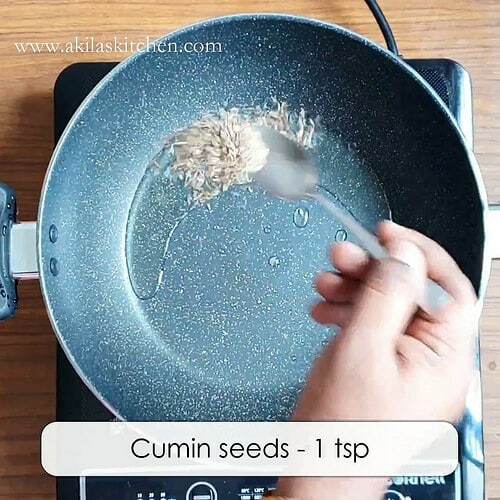 Mostly Vegetable Raita becomes a good side dish for this baby corn and tomato Masala Rice, but you can also try out other Raita recipes. 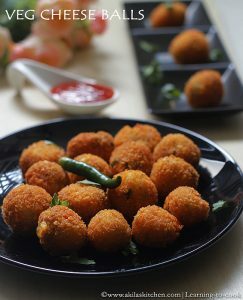 I too the recipe from here and changed slightly according to our family tastebuds. 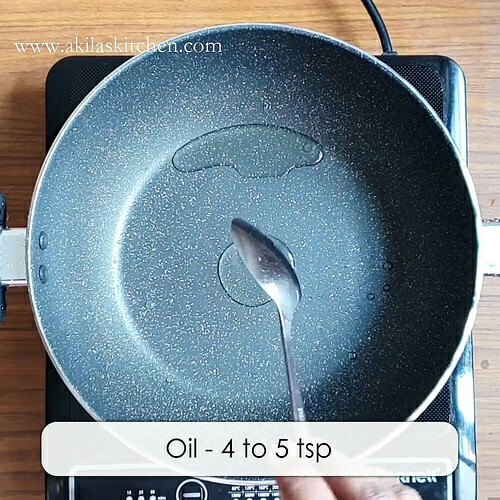 Heat oil in a pan over medium heat. 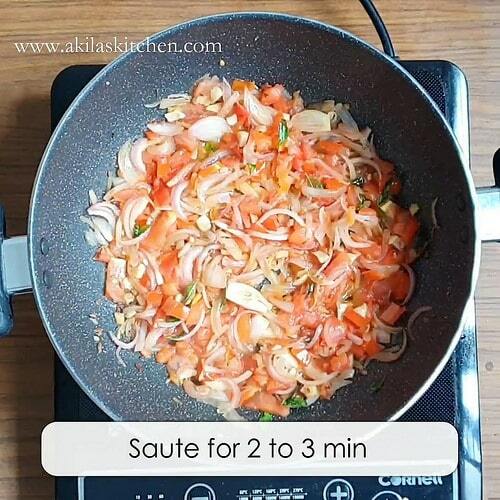 Add jeera, saute for a min. 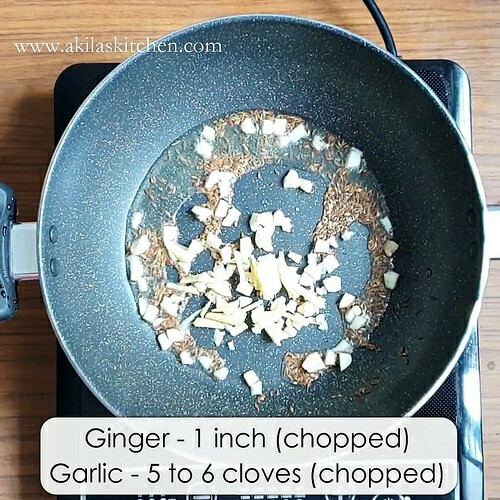 Add chopped ginger and garlic and saute for a couple of minutes. 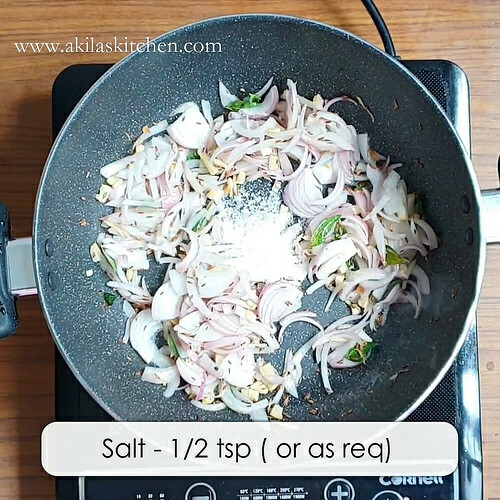 Now add the onions and cook until it lightly softens. Add required salt. 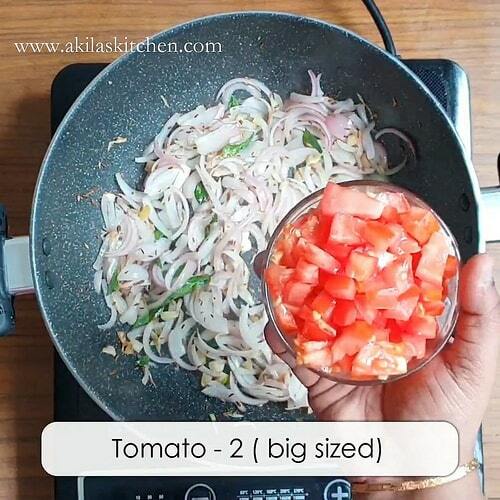 Add and Stir in the tomatoes and cook until it is slightly soft. Once the tomatoes have softened, add in the baby corn, saute for fre min. 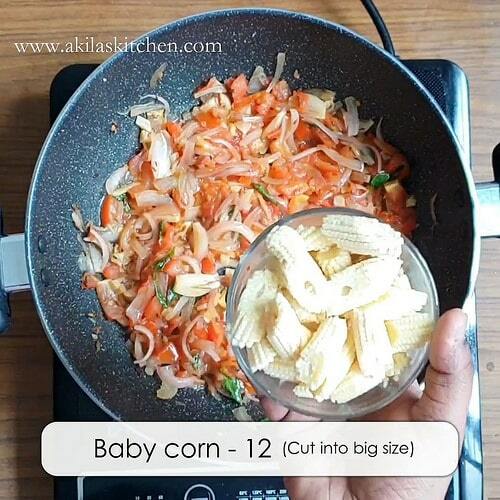 Add water, cover and cook the baby corns for 5 to 6 min. Now add the pav bhaji masala, garam masala and jeera powder and toss. 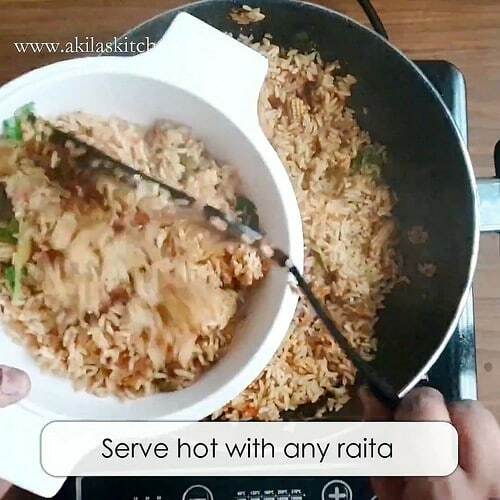 At this stage, turn the heat to high, add the cooked rice and stir fry them. 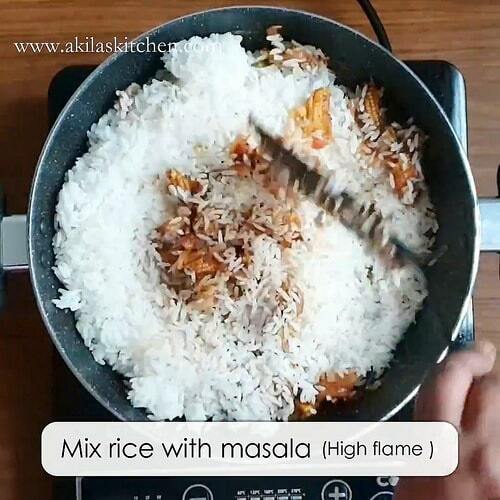 Mix the rice well with the masala, until all the masala is well coated into the rice. Simmer and cook thr Baby Corn & Tomato Masala Bath for about 3 to 4 minutes. Check for the salt and spices and adjust accordingly. 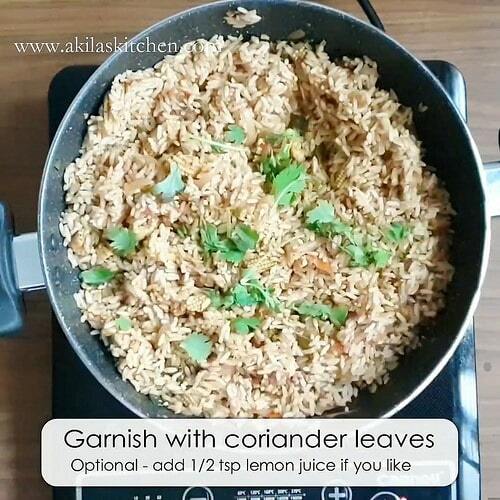 Add the Coriander leaves and also add the lemon juice if you want. Mix them slightly. 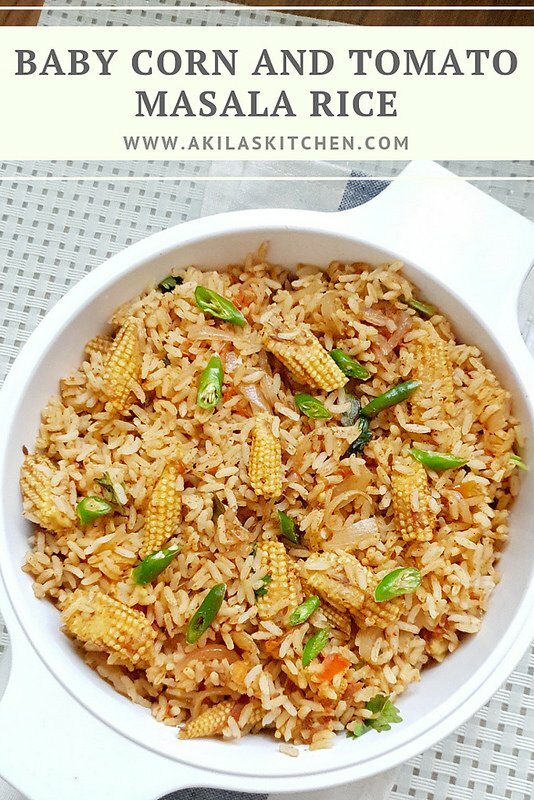 Serve the hot hot baby corn and tomato Masala Rice with your favourite Raita. 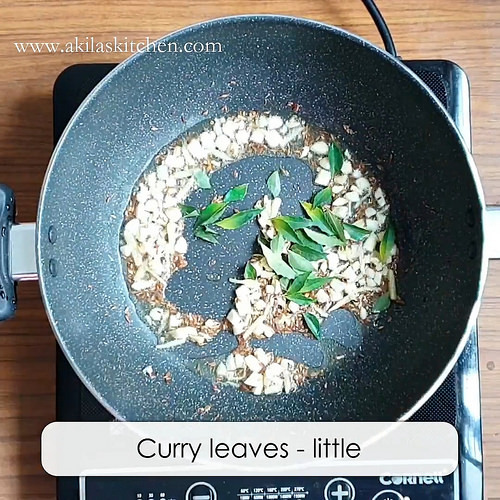 Also add curry leaves fry for a minute. Once the tomatoes have softened, add in the baby corn, saute for few min. 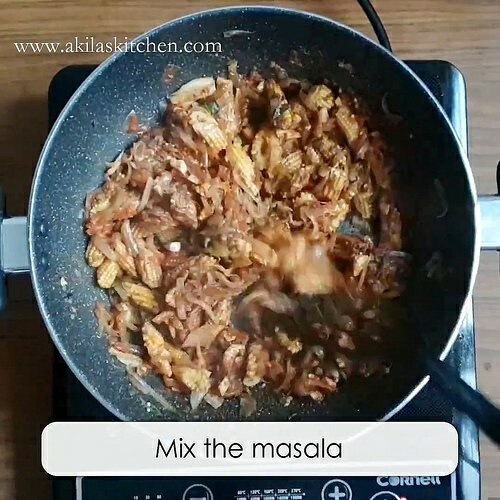 Mix the rice well with the masala, until all the masala is well coated into the rice. 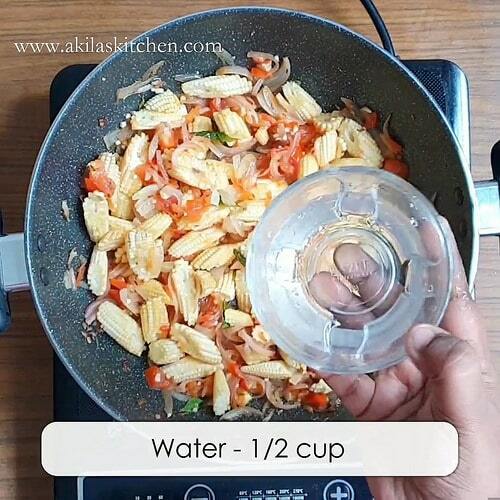 Simmer and cook the Baby Corn & Tomato Masala Bath for about 3 to 4 minutes. Check for the salt and spices and adjust accordingly. 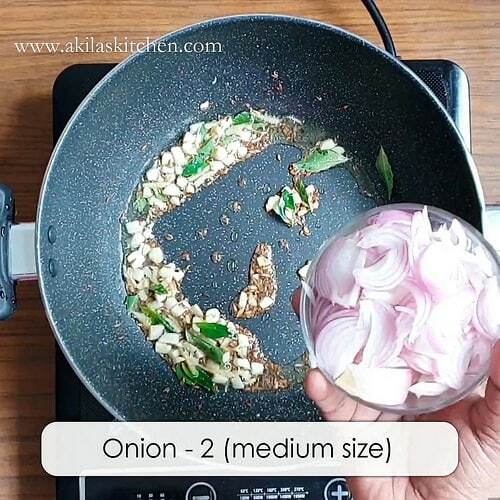 Add the Coriander leaves and also add the lemon juice if you want. Mix them slightly. 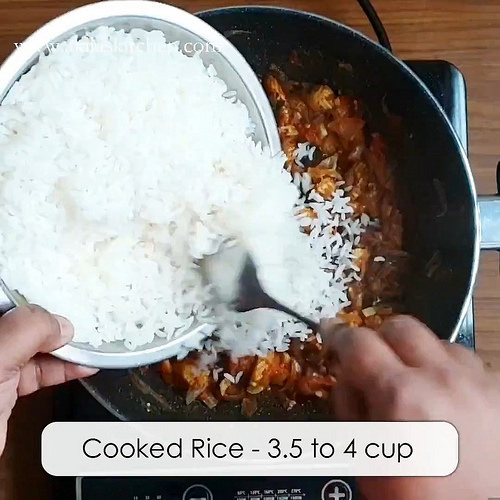 Serve the hot hot baby corn and tomato Masala Rice with your favourite Raita. I served it with mixed vegetable Raita. 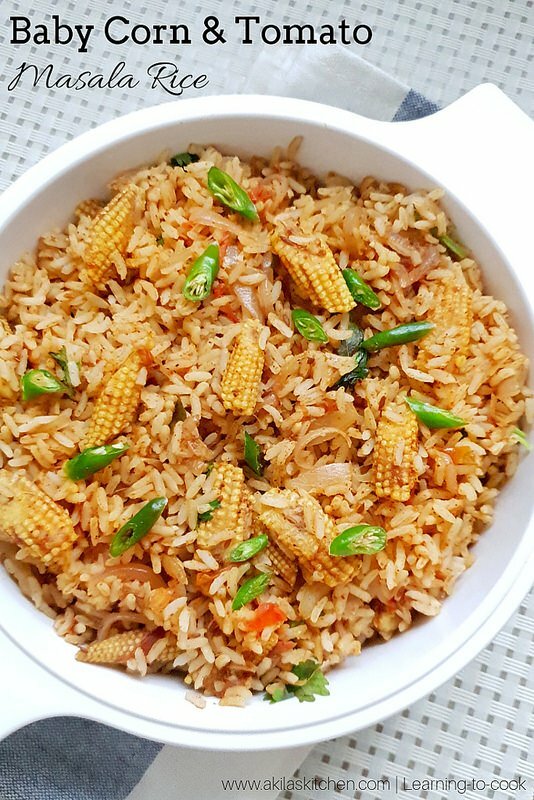 Yummy yummy Baby Corn and Tomato Masala Rice is ready. 1. You can cook the baby corn separately in a pressure cooker for 1 whistle. 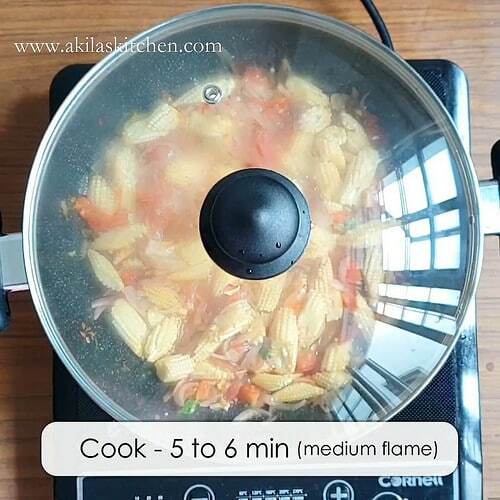 If you pressure cook them, add water immediately and open the cooker, else the baby corn becomes very soft. 2. Adding lemon juice is purely optional. 3. 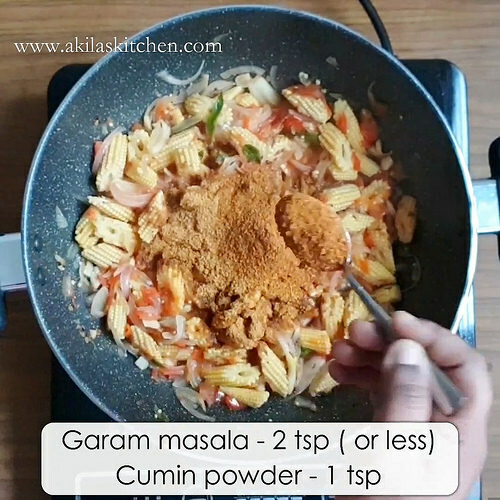 If giving to kids, reduce the quantity of garam Masala as my kids complained of spiciness.